Call the store at (540) 814-0604, sign up on our website www.SouthernRootsSML.com, or email SouthernRootsSML@gmail.com to reserve your seat. Come learn the technique we use to make our beautiful Deco Mesh wreaths! 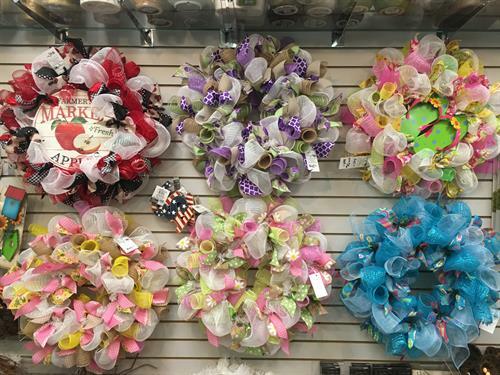 You can pick the color(s) of Deco Mesh and ribbons for your wreath from our in-store supplies to customize your wreath for your home or dock. All supplies are included in the price of this class, $45.00. Any extra signage or embellishments to the wreath are sold separately. A $10 non-refundable deposit is required when you sign up. The remaining payment is due the day of the workshop. Reservations are required to attend. Call Southern Roots at (540) 814-0604, email SouthernRootsSML@gmail.com, or visit our website- www.SouthernRootsSML.com- to reserve your seat!